US local broadcast giant Sinclair Broadcast Group is to create a joint venture with Korea’s SK Telecom to develop broadcast solutions based on the ATSC 3.0 standard for the US and international markets. The two companies will jointly fund and manage a joint venture company within the first quarter of this year, with the aim of developing products that can be marketed in the US later this year. 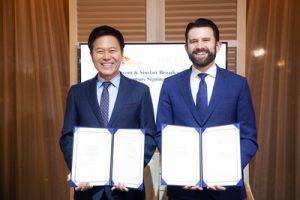 The joint venture agreement follows last year’s memorandum of understanding signed between SK Telecom and Sinclair at CES 2018 to jointly develop leading technology for ATSC 3.0 broadcasting. “SK Telecom will work closely with Sinclair Broadcast Group to gain leadership in the next-generation broadcasting solutions market in the US,” said Park Jung-ho, President and CEO of SK Telecom. “Sinclair is excited to partner with SK Telecom, a wireless technology leader, to explore and commercialize solutions that optimize the economic value of our spectrum, our broadcast infrastructure, our programming ventures and our emerging OTT platforms. Bringing these assets together in a converged broadcast/broadband platform environment will be a significant value multiplier,” said Chris Ripley, president and CEO of Sinclair.